Welcome back to the Digital Dojo, and this month’s look into the weapon combat world of Samurai Shodown. 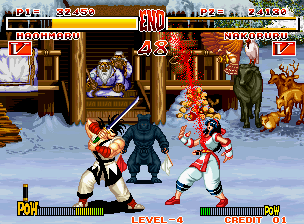 Know as Samurai Spirits in Japan, this game was developed and published by SNK in 1993 for the Neo Geo arcade system and ported to many home platforms. The game set itself apart from others of it’s time by putting the main focus on weapons combat instead of hand-to-hand, and placing the story in feudal-era Japan as opposed to modern time. As one of the first weapons based fighters, Samurai Shodown’s gameplay was as simple and direct as 2D fighters can be. However, while facing down your opponent to go for the win, SNK did try to vary up the repetition of fighting by having a runner in the background who would randomly throw out things to help heal or damage a fighter. During the matches there was also a hefty amount of blood. This was as it should be when fighters are using weapons, especially since many of them are bladed. While the blood levels were a good realistic addition to this past classic, we need to examine the weapons use and see how true to form it is. I will start by laying a very basic foundation for weapons fighting through it’s strikes and use that as a reality template for comparison. A simple concept with weapons is to look at the opponent’s body in terms of zones. These zones can be attacked through striking angles numbering 1 through 9. To determine the authenticity of the game fighting we can try to match attacking angles, along with blocking and countering. As the characters use many different weapons in this game we will only focus on two of them, because the angle system above works for most weapons. The best place to start is with the main character Haohmaru, a Japanese wanderer who uses the Katana sword. Not only does he show solid striking angles with the weapon, he also keeps both hands on it to stay true to a proper push/pull motion in his strikes. It is very impressive this was included in the game because it’s what allows for a proper cut with the sword, and not a hacking motion like an axe. The sharp technique of his style though, is limited to mainly angles 1,2, 7, and 8 (think shoulders and legs) with 5’s (stabbing) thrown in from time to time. Blocking is a weak spot in the game however, as Haohmaru blocks very ambiguously. Characters also never use parry blocking which is basically blocking a strike with the same strikes (this only works with downward or upward angled strikes). Jubei is another Japanese wanderer, although he used to be a Samurai. As a Samurai he fights with two swords, and while this is certainly possible as Samurai did carry three swords, the Katana, Wakizashi, and the Tanto, it is also a mistake in the game. A mistake, because both of the swords appear to be a Katana, as they are the same length. Both the Wakizashi and the Tanto are shorter swords. Furthermore, Samurai rarely would pull the other swords, and certainly not fight with two drawn the whole fight, because only having one hand on the weapon weakens the grip and blow strength. Jubei does have a more varied striking angle mix, but still suffers from unclear blocking. Overall the weapons fighting accuracy of the game is 50/50. Strong striking and weak blocking comprise the battle split, but other elements, even though they were not the focus of this lesson, were also weak. These small thing like the double swords of Jubei and the opening of the game that gives a very messed up version of the Samurai code (they did not live to destroy all of their enemies), add up to put Samurai Shodown into the classic, but very mediocre realism category.